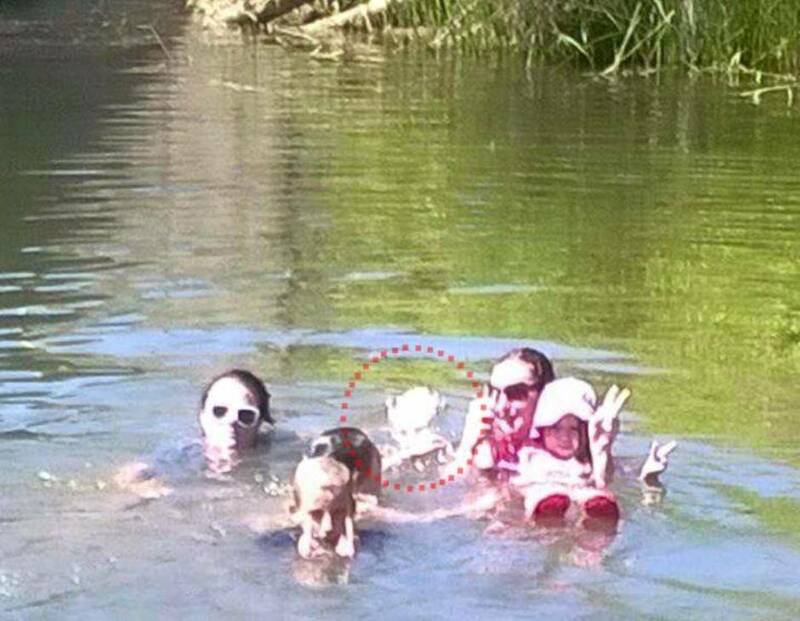 In 2014, Kim Davison went for swimming one day with her friend Jessie Lu and three kids .They went to the Murphy’s Hole in Lockyer River, Helidon in Queensland Australia. Photographs were taken when they were playing in the water. One of the pictures was posted by Ms. Davison on the Toowoomba Ghost Chasers Facebook Page. This spooky pic taken by Ms. Davison shows four kids and two adults playing in water. They were shocked to see the fourth face in the picture. Kim and Ms. Lu were very sure that there were only two kids and two adults in water and the third kid was clicking the pic from her camera phone. They said that there was nothing in between them when the picture was taken. Ms. Davison is holding a small girl and Jessie Lu in white sunglasses is next to her. On closely examining the fourth image they realized it was a white face with dark eyes and two horns on either side of the head. Its fingers are on Ms. Davison’s shoulder and on the small girl’s right arm. On seeing the image on Facebook many comments were made, some said that the two horns looked like two ponytails or buns. A fellow user then shared the story of Doreen O’Sullivan a 13 yr. old girl who accidentally drowned in the same creek in the same spot in 1913. Her obituary was found in the Brisbane Courier dated 22nd November 1913. 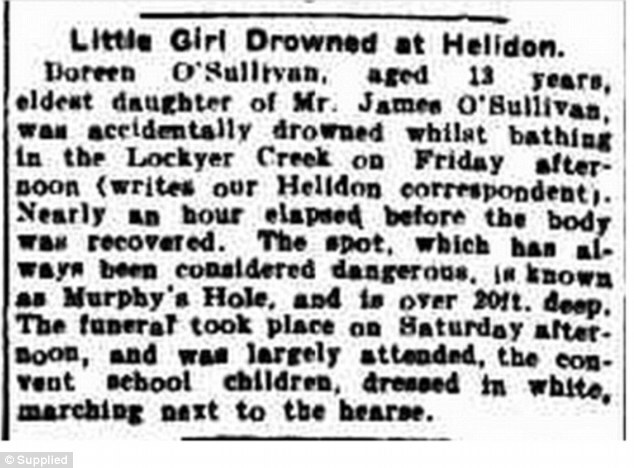 The Notice reads that – “Doreen O’Sullivan, aged 13 years , the oldest daughter of Mr. James O’Sullivan, was accidentally drowned whilst bathing in the Lockyer Creek on Friday afternoon. Nearly an hour elapsed before the body was recovered. The spot, which has always been considered dangerous is known as Murphy’s Hole and is over 20 feet deep. The funeral took place on Saturday afternoon and was largely attended, the convent school children, dressed in white, marching next to the hearse.” Her grave was also found. On reading this Kim Davison recollected that they had experienced strange things that day when they were swimming in water. She felt someone’s presence behind her, but she ignored it. Twice someone in water even grabbed her elder daughter’s leg. This made Ms. Davison believe in the presence of a spirit in water. By looking at the picture she was convinced that the unknown face was that of the 13-year-old unfortunate Doreen. Kim got two paranormal experts to check the picture. After investigating the photograph carefully they concluded that the shape of the image was that of a child. Seeing the photo on the facebook page many claimed that they could see many more spooky images. People who don’t believe in ghosts also came up with other possibilities. They said that it might have been a splash of water and the eyes see what it wants to see. Some said the image might be that of another kid swimming with them, they probably didn’t notice. The image is still a mystery. Whoever sees the picture has its own observation. See it carefully and decide.